Chickens in Your Backyard is all anyone needs to know to raise chickens! 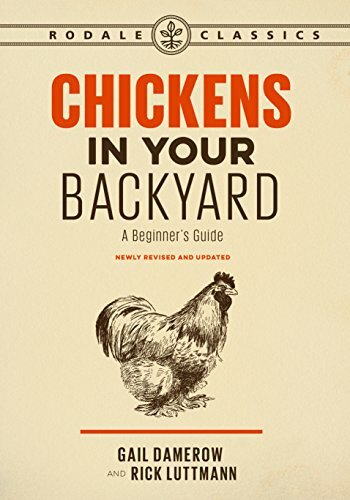 Chickens in Your Backyard is newly revised and updated. It includes how to set up a coop, a run and a home for your new chickens. There are chapters on feed, eggs, water, cleaning, disease, breeding and incubation. Showing and butchering chickens are also covered. The book concludes with the pros and cons of starting your flock with eggs, chicks, young or mature chickens. Along the way, the author provides lists of breeds for different goals (friendliest, best layers, biggest breasts). Spring is the best time to purchase chicks and begin your chicken experience. However, young and mature chicken prices are much lower in the fall. Egg sexing is a myth. Butchering chickens one day can lead to becoming vegetarian the next. As a city girl, raising chickens seems like a good way to go back to my family’s midwestern roots. Chickens are allowed where I live. I hear a rooster or two each morning. I didn’t think about how hard it would be to protect them from hawks and heat where I live in the High Desert. Maybe when I retire and have more free time, I’ll get a few bantams. When I do, I’ll be sure to have this book by my side. 5 stars! Thanks to the publisher, Rodale Books, and NetGalley for an advanced copy.